We girls deserve our moments of fun and girls time. 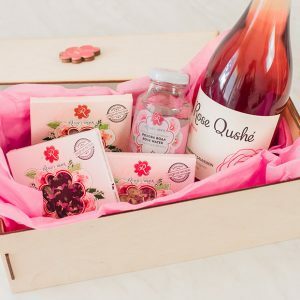 On an occasion or just like that, the content of this box will raise up the mood of the group in the most feminine way, with a touch of Queen Rose.  To be shared with girl friends! Tea and chocolate – a combination that warms body and soul in a cold day. 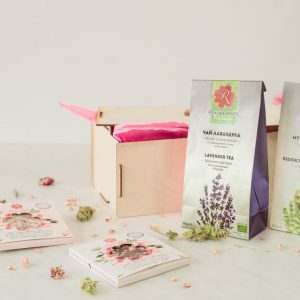 In this gift box we put gogether for you two types of emblematic Bulgarian herbal tea – rose for good mood, and sideritis scardica mountain tea for stronger immune system. Then we sweeten the moment with lots of chocolate. Mmm… that flavour! We love giving and receiving personal attitude. 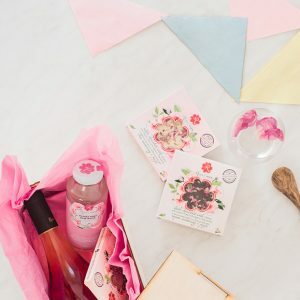 That’s why we offer you the chance for maximum personalization of the gift you are about to prepare. 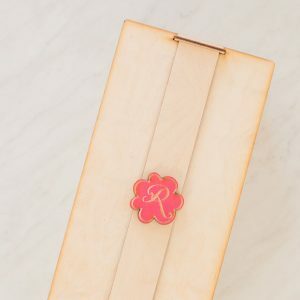 Now you can select which Rosey’s mark products we should put with care in that beautiful wooden gift box. 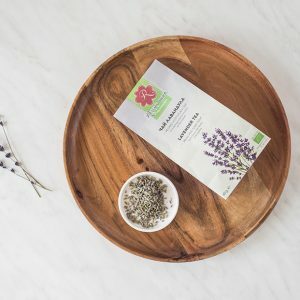 Surprise a beloved someone with product combination of your choice, starting here! 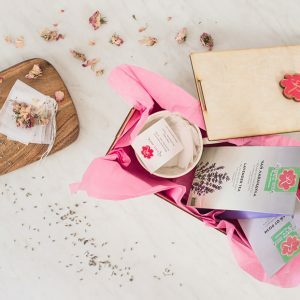 We have put together this gift set for the most passionate tea lovers. 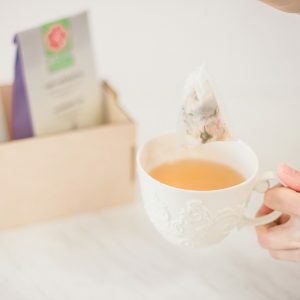 In the elegant wooden Rosey’s mark gift box are hidden two types of Bulgarian floral tea, filter tea bags and a unique porcelain cup. 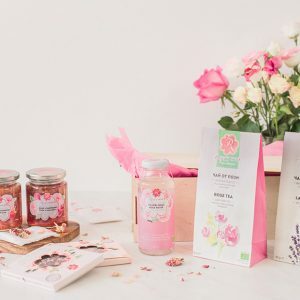 Because drinking rose tea is a ritual and you deserve it! 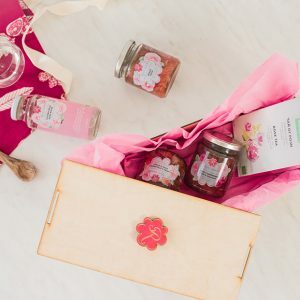 Remind the one receiving this gift box to put on the cooking apron and start discovering new tastes and flavours, with no limits. 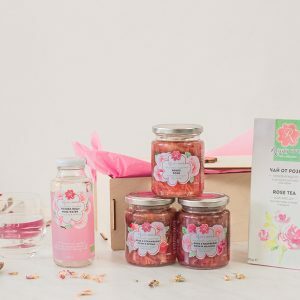 The rose gives a fragrant promise to satisfy to the full the cravings of the passionate foodies and home chefs with its unique floral touch in any given dish. 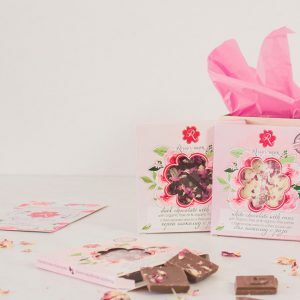 Edible roses galore. That’s what we call abundance! 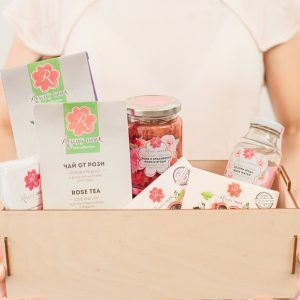 In this box we made our best to make the optimal Rosey’s mark products selection, for those who just want to try everything. Well, this box is the right choice. Under the wooden lid is hidden the unexpected variety of tastes which the oil-bearing rose can give, with no limits.